How will you use glass in 1982’s cars? We don’t know for sure, but our research scientists have their eyes on the future. Over 500 of them… at our Glass Research Centers… are continually looking for ways to make auto glass stronger, safer, more adaptable to bending, and more resistant to weather and abrasion. 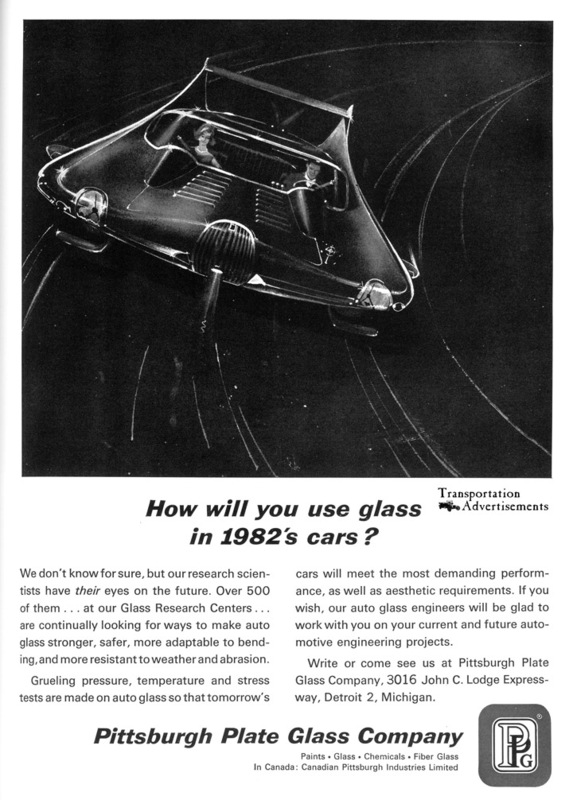 Grueling pressure, temperature and stress tests are made on auto glass so that tomorrow’s cars will meet the most demanding performance, as well as aesthetic requirements. If you wish, our auto glass engineers will be glad to work with you on your current and future automotive engineering projects. Write or come see us at Pittsburgh Plate Glass Company. 3016 John C. Lodge Expressway, Detroit 2, Michigan. Transportation Advertisements is powered by	WordPress 5.0.4 and delivered to you in 0.364 seconds using 28 queries.